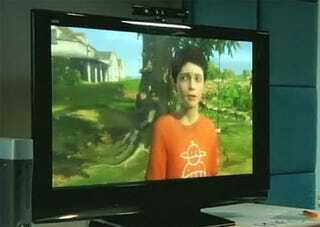 I talked to Peter Molyneux's virtual boy on the Xbox 360. He liked the color of my shirt. On Monday night, I got the briefest of demos of what may be the most ambitious piece of software known to be in development for Microsoft's new motion-control Project Natal: the virtual-person game known as Milo. And, yes, Molyneux told me, this will be a game. Molyneux is wary of over-promising these days. He holds back more than he used to when he hyped features early for games like Fable and The Movies. Today's brief Milo demo introduced a new element: he repeatedly cautioned that some of what I would experience with the game were "tricks." The demo took place in a brightly-lit white room in the Standard Hotel in Los Angeles. A test version of Project Natal was set-up, including a camera over a TV and some other sensors. (None of Microsoft's Natal demos tonight used anything that looked like final hardware). On the TV, a boy, Milo, sat on a swing hanging from a tree. Molyneux asked me to stand up in front of the TV and to begin looking around. The game was using head-tracking technology, I discovered. Leaning my head to the left or right — or backing away or walking closer to the TV — smoothly adjusted the game's camera angle. The tracking was responsive and intuitive. I looked away from the TV to ask Molyneux what I should make of this Milo project. Is it really right to think of it as a game? He said it had to be. It had to have a goal and even an ending, he said. At its most basic he said that we could think of Milo as a Tamagotchi but that it would be much more advanced and magical than those old virtual pets ever were. Molyneux had me wrap up the demo by approaching Milo again. He asked me to call Milo over by saying my own name and acting happy. Milo walked up to me and complimented me on my blue shirt (my shirt was indeed blue). Then he stood there, waiting for me to say things. There was a little awkwardness here. The Milo demo was partially being manipulated by a developer who was sitting nearby, and I couldn't tell if he was merely calibrating the game or how much he was pulling its strings. I said nice things to Milo and the virtual boy smiled. I said I was standing next to Peter Molyneux and he sort of sighed. The most charming moment was that blue-shirt moment. It felt like this virtual person made a connection with me. After I stepped away, Molyneux asked me what I thought. I told him the set-up was promising but that I'd want to use it more to see how well it works. Given how new the Natal project seems — and given how long I know Molyneux has been wanting to make a game about influencing the life of a virtual child — I questioned how long he and his team had intended to even integrate a camera. Molyneux said that he'd wanted to do something like Milo for a long time but that the idea hadn't really clicked with Microsoft until the Natal project came about. It was coming together. I left impressed with the ambition on display but also certain that what we were shown was loosely stitched. Much tightening and tuning will be needed to make Milo feel like more than a collection of tech experiments — to feel alive. It's exciting that that's Molyneux's goal.